A pneumothorax or collapsed lung occurs when there is a build-up of air in the space between the lungs and the rib cage – known as the pleural space. Symptoms include a sharp chest pain and shortness of breath. This condition can be caused by a specific injury like broken ribs, or just happen for seemingly no reason. Read more on the causes, symptoms, and treatment of a collapsed lung. Collapsed lung symptoms include a sharp chest pain which is made worse when breathing deeply. The patient will feel tightness in the chest and shortness of breath. A dry cough may be experienced. In more severe cases rapid heart rate, fatigue and a bluish tint to the skin and lips may be seen. The severity of symptoms depends on how much air has entered the pleural space. In the most severe case, known as a tension pneumothorax, the air which has entered cannot escape at all and more air enters with every breath, resulting in symptoms getting rapidly worse. A pneumothorax or collapsed lung occurs when there is a build-up of air in the space between the lungs and the rib cage – known as the pleural space. This puts pressure on the lung so that it cannot expand as much as it usually can. 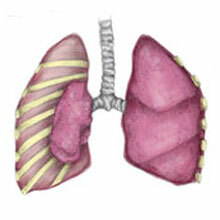 A collapsed lung will usually only occur on one side at a time. There are two types – Traumatic and Spontaneous. Traumatic Pneumothorax as the name suggests, occurs as a result of a traumatic injury, allowing air from outside the body into this space. This may occur with injuries such as broken ribs or gunshot or stab wounds. It may also happen following chest surgery. Spontaneous Pneumothorax occurs for no apparent reason. What happens is that an air sack on the surface of the lungs called a Bulla, bursts. The bulla may burst during heavy exercise or certain activities including scuba diving, flying or hiking at altitude. Respiratory diseases such as Asthma and COPD or chronic obstructive pulmonary disease also increase the risk. Following a lung X-ray to confirm the diagnosis, the appropriate treatment is undertaken, depending on the severity of the condition. Minor cases usually heal on their own in a few days. The gap through which the air entered the space heals and the body absorbs the excess air. Extra Oxygen may be needed. More major injuries require a chest drain to be inserted into the pleural space to allow the air to disband. This may be kept in place for anything from a couple of days to a few weeks, depending on the healing time for the injury. In repeated cases, a procedure known as pleurodesis may be performed, which uses a special chemical to stick the two layers of lung lining together, meaning air cannot get between them.